A close look at Macron’s election, the collapse of the Socialist Party, and the end of a long cycle for the French left. So Emmanuel Macron has his majority, a smaller one than expected. The opposition is in pieces. The Left has to be rebuilt. As for the new president, he is not at the end of his labors. His legitimacy is very fragile, because it is based on such a thin layer of the population. The second round marked a moderation of the results of the first round. Many surveys recorded that a majority of those interviewed did not want the newly elected president to be able to rely on a compliant majority in the future National Assembly. The En Marche! tactic that might have proven devastating — seeking to mobilize right-wing voters to wipe out the Left, and then to mobilize the Left to wipe out the Right — was in fact only a moderate success. The voters of left and right did not mobilize for Macron. 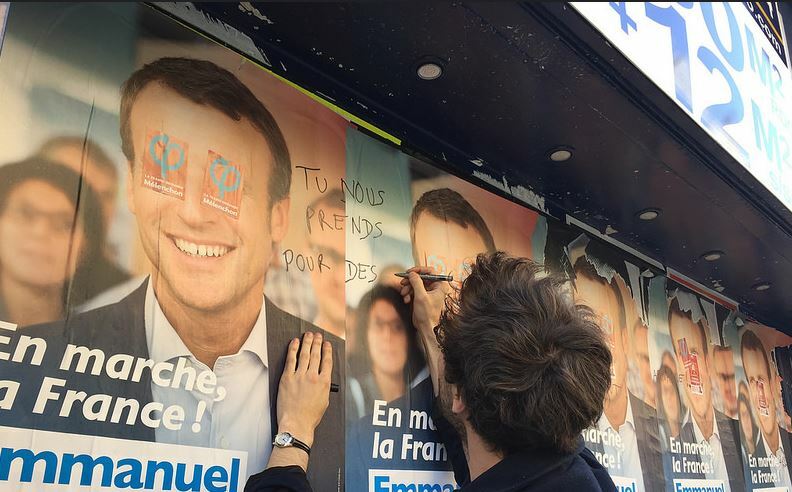 This was very much to the pleasure of the local party apparatuses, which did not look kindly on the wave of support for Macron playing out at the territorial level. Anne Hidalgo, the mayor of Paris and a member of the Socialist Party, could testify to that! So the French people voted for La Republique En Marche less than the omens between the two rounds had suggested. But with a third of the votes in the first round, the new president does have his majority (the sixth biggest since 1958). Yet this majority also has its limits. When almost 60 percent of eligible voters abstain from casting their ballot — that is to say, when they are given the opportunity to vote in what is meant to be a decisive contest — this means that politics is in crisis and that democracy is ill. All the indices — structural abstention, the discredit that the parties have fallen into, distrust of elected officials — indicate that we have reached the point where in most people’s minds the political institutions have lost their meaning. How could it be otherwise? Candidates promise things and then fail to put them into practice in government. And that is when they do not do exactly the opposite of what they were meant to do. Political parties seem to have become the weak-willed defenders of the positions of power they have acquired, and they do not advance any clear and distinct project. The public spirit is undermined by the combination of corruption, the retreat of the state, and the cult of wealth. In their exercise of power, the Left and Right merge into one. As for the institutions, they work at maintaining “governance.” So the choices made by universal suffrage are only respected when they coincide with the elites’ own convictions. Citizen feeling has withered and politics seems useless. The values that politics ought, by principle, to carry forth are permanently giving way to fresh constraints — which almost always mean economic ones — whose legitimacy is not open to any challenge. If we do not free ourselves of this crisis, the very basis of any democracy will be under threat. Discontent and anxiety will not lead to concerted collective action, but to resentment, bitterness, and hatred. Combativeness will give way to the stigmatization of scapegoats, to flare-ups of violence followed by resignation. There is nothing to be won for emancipation in this game, where in the last instance it is always the dominant who will remain the strongest. Breaking out of this damaging cycle is now a vital necessity. This is not a matter of mere words, ready-made formulas, and ways of presenting things. Politics does not survive without hope — an emotional hope, certainly, but also a rational and concrete one. It has never been as dynamic as when it can rely on clear controversies, which in general concern the projects that we seek to place at the heart of our common life. In abdicating this mission in favor of a technocratic management of the immediate, politics has lost its meaning for millions of individuals. Nothing is of more fundamental importance than reconstructing this meaning. Results of the parliamentary elections under the Fifth Republic (first round) from 1958 to 2017. Des inscrits = of registered voters, Divers gauche = Miscellaneous Left, non-gaull = non-Gaullist, Divers = Others. The temptation to cleave to the center is a constant of French history. It was born in the nineteenth century, out of the rejection of both ancien régime society and the revolutionary path. At the outset it was in part linked to political liberalism. But for fear of revolution it very soon faded away in the face of the slide toward conservatism. Like political liberalism, in France the center has been an active myth more than a well-established reality. In general, the recourse to the center appears when the Left or the Right find themselves in difficulty. Outside of these moments, it is reduced to appropriately small proportions. Under the Fourth Republic, in the early days of the Cold War, the radical opposition of the Communists and Gaullists — at the two ends of the political chessboard — seemed to justify the constitution of ”Third Force” parliamentary majorities bringing together part of the Right (the “popular republicans”) and part of the Left (the Socialists and the Radicals). This unstable formula continually fell victim to its fragilities, and would eventually perish together with a republic reduced to governmental instability and the compromising of its parties. Recognizing the accelerated decline of the French Communist Party (PCF), François Mitterrand sought to strengthen his position by seducing the center during his 1988 re-election campaign. This approach allowed him to win the presidential contest, but it was rejected by the left-wing electorate at the parliamentary elections that followed. On the Right as on the Left, centrism thus seemed doomed to a modest place, always subordinate even as its fortunes varied according to the circumstances. François Bayrou, today a Macron supporter, has symbolized this position of half-shades. The new reality today is that both the Left and Right of governmental vocation are simultaneously in the eye of the storm, with each of them exhausted by administrations that have shown the impotence of politics more than its usefulness. Whereas in previous eras the Left and Right benefited, in turn, from the opposing side’s woes, now they each find themselves unable to do this. Now, the very relevance of the opposition between them is in question. In the runup to the presidential election [center-right mid-1990s prime minister] Alain Juppé hoped to use this stalemate as a basis for relaunching a classic centrist approach, in the spirit of past attempts. The voters in the Right’s primary contest decided otherwise. The Right has now paid heavily for this foolhardy approach. The way was thus clear for a centrism of more left-wing hues, on the model of the ”Clintonite” Democratic Party or Matteo Renzi’s Italian Democrats. Emmanuel Macron leapt into the breach with his curiously both elitist and catch-all movement, based on a “civil society” that — as with the dominant spirit of the European Union — fuses with the heights of economic life, communications networks, and administrative power. Yet neither the classic right nor a deeply crisis-hit Socialist Party proved able to counter this. The presidential election and then the two rounds of the parliamentary contest have confirmed the real balance of forces: what was considered the centrist option won by default. Yet a victory by default can very quickly transform into a firmer hegemony. So we should not underestimate the overall Macronian phenomenon, even when its properly political capacity is still limited. The man who made it possible does not lack determination and the capacity to think. He will try to give substance to the alternative that he has so powerfully put forward, establishing it as a coherent political force. The extent of the crisis within the Socialist Party and among the right-wing heirs to Gaullism will leave all the more space for his efforts, given the fact that as things are commonly represented the notions of left and right have lost a major part of their meaning. The result of the first round of the parliamentary elections spectacularly illustrates the dual retreat that feeds this loss of meaning. The total for the Left and the Greens has reached its lowest point (23.9 percent) since Liberation in 1944. As for the Right, it has recorded its worst score since the beginning of the Fifth Republic. The fact that France Insoumise could not realize the dream of a parliamentary majority and taking over government should not hide the major fact that a young movement launched by Jean-Luc Mélenchon has become the leading force on an otherwise very weakened left. In the first round, with its 2.5 million votes and 19.58 percent score, France Insoumise did better than the two parties who were once the pivots of the French left, the PCF and the PS (9.1 percent in total). History certainly does not lack for ephemeral formations that a certain conjuncture stimulates before they fade away once it has passed. To be frank, the radical left is probably not at the end of a recomposition process that will ground it in the long term. But in the immediate, we should recognize that France Insoumise has at least set down one option that could be at the heart of this recomposition. 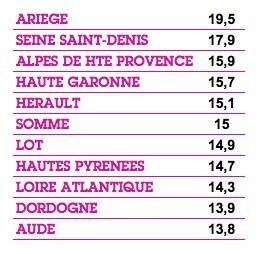 Correction: France Insoumise received 22.97% of the vote in the Dordogne department. Conversely, its implantation remains weaker in the center and the west, and especially in the less urbanized départements (Allier, Cher) which have since the mid-1980s become pivots of what remains of the Communist vote. It is also worth noting that the parliamentary election has rather less brought into relief the other anchoring point of Mélenchon’s vote. Since 2012 he had seen a spectacular rise in the densest urban areas, in particular in the heart of the metropolises. But this time the characteristics of this atypical vote — with the greater tendency toward abstention among the young and the popular layers — have rather weakened this aspect of his support. However, good results in the areas surrounding Paris and in the capital itself suggest that this movement has weakened rather than disappeared. Indeed, both the PCF and France Insoumise candidates came out of the second round of the election rather well. Seventy-eight of them exceeded the first-round threshold allowing them into the run-offs on June 18. Twenty-seven of them were elected in the second round, and as a whole these seventy-eight candidates picked up 6 percent of votes nationally. In the constituencies where they were present, they obtained a not inconsiderable level of support, at 47.1 percent of votes cast. France Insoumise achieved scores ranging from 64.2 percent (Le Nord, second constituency) to 33.9 percent (Morbihan, third constituency). It fell short by under 2 percent in five constituencies, and had a total of 17 MPs elected. It took over fifteen seats that had been held by the Socialists, including those of Bruno Leroux (replaced by Eric Coquerel), Élisabeth Guigou (Bastien Lachaud), Claude Bartolone (Sabine Rubin), Daniel Hanotin (Stéphane Peu), Razzy Hammadi (Alexis Corbière), and Daniel Vaillant (Danielle Obono). It strongly established itself in Seine-Saint-Denis (five seats, including the one won by Clémentine Autain, plus that of the Communist Stéphane Peu), in Le Nord (two constituencies) and in the two Ariège constituencies. Jean-Luc Mélenchon’s election allowed it to win ground in Bouches-du-Rhône. It won back Noël Mamère’s seat in Gironde. In Val-de-Marne, it won the tenth constituency, which the [left-Gaullist] MRC’s Jean-Luc Laurent had snatched from the Communists in 2012 (Ivry-Gentilly). It thus managed to concretize the solid implantation that the presidential election and the first round of the parliamentary elections had already pointed to. For its part, the PCF almost swept the board of the constituencies where it had reached the second round. Ten of the twelve second-round candidates officially standing on its ticket were elected, as well as two other PCF members (Bénédicte Taurine in l’Ariège and Stéphane Peu in Seine-Saint-Denis) were elected on the France Insoumise ticket. These 2017 elections were thus paradoxical for the Communists. 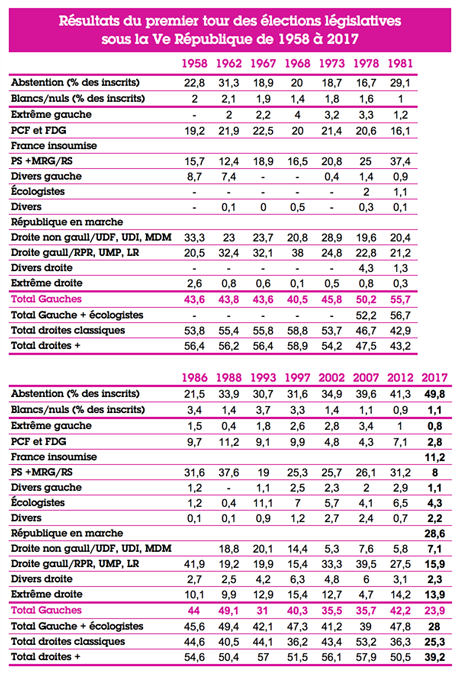 In 2012, when the Front de Gauche won 2.5 percent more than the PCF alone had in 2007, the Communists lost half their MPs (eight out of fifteen). In 2017, having scored only 2.7 percent of votes in the first round, the Communists have strengthened their presence in the National Assembly. The PCF did lose in Nicolas Sansu’s seat in Le Cher in the second round, but it held onto Alain Bocquet’s and Jean-Jacques Candelier’s under-threat seats in Le Nord. In Seine-Maritime it snatched three seats from the Socialists, and with Dieppe mayor Sébastien Jumel it asserted itself as the main opposition force to La République En Marche in prime minister Edouard Philippe’s own département. Winning almost two-thirds of votes cast, André Chassaigne was again victorious and confirmed the PCF’s solid implantation in the Puy de Dôme département, despite a strong challenge from France Insoumise. As for Elsa Faucillon in Gennevilliers-Colombes, in snatching the Socialist Alexis Bacheley’s seat she made up for the loss of Nanterre in this same Hauts-de-Seine département, itself the result of the divided vote between the partisans of Jean-Luc Mélenchon. The PCF thus profited from the breakthrough at the presidential election, which breathed life into what were once its areas of strength — areas where it had been in constant decline up till 2012. But if it strengthened its position in Puy-de-Dôme and above all in Seine-Maritime, it now has to reckon with France Insoumise competition in its once happy hunting-grounds in Le Nord, Seine-Saint-Denis and Val-de-Marne. With its seventy-two MPs the Left is at the lowest level of parliamentary representation in its history. The table below shows the tendency of the Socialist and Communist votes since the unification of the Socialist Party in 1905. Everything suggests that things have come full circle, from the party of Jean Jaurès and Jules Guesde to today. When a united Socialist Party was created at the beginning of the twentieth century, the first election it faced put it at 10 percent of votes cast and it sent fifty-four MPs to parliament. At the first round of the 2017 parliamentary elections the Communist and Socialist parties together achieved 10.2 percent of votes, and they ended up with a parliamentary representation of forty MPs. Communists and Socialists structured the twentieth-century French left, achieving a majority by themselves in 1945 and 1981. 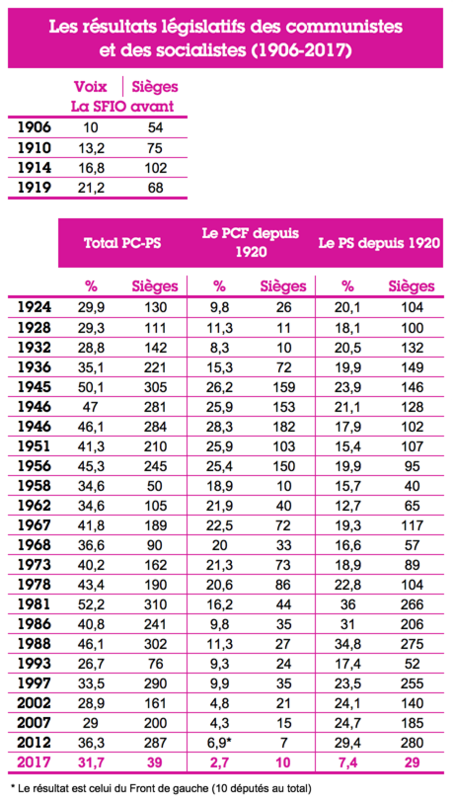 At some times the PCF was dominant (1945-1978) and at others the PS (1924-1936, 1978-2012). But since the Radical Party lost its predominance in 1936, all the formations other than the Communists and Socialists have been doomed to playing bit-part roles. For a time, the weakening of the PCF, which began in the 1970s, was compensated by the PS’s crushing hegemony. But this situation owed to the PS’s capacity to reconcile a language marked by the historic values of socialism and a managerial governmental practice increasingly aligned with the canons of the dominant neoliberalism. As soon as this unstable alchemy was no longer operational and the Socialists felt that they were forced to choose between contradictory alternatives, the respective declines of the PCF and the PS combined, rather than balancing each other out. This return to 1906 levels is symbolic, for it suggests that the Left has reached the end of a long cycle. Beginning in 1789 and completed at the beginning of the twentieth century with the Radicals’ hegemony, the French left’s first cycle was constructed around the demand for democracy (equality before the law), stimulating the formation of a Jacobin bloc bringing the rural and urban popular layers together around the middle classes. The second cycle, beginning in the interwar period, articulated the expansion of the workers’ movement and the affirmation of a more social left centered on equality of conditions and the advance of a regulating and redistributive state. The world of urban labor acquired an advanced position in this cycle, especially through the intermediary of Communist activity. For some decades this allowed the articulation of the social left and the harder left. The end of the 1970s and the slide toward the Socialists’ hegemony began to undo the link between the Left and the social movements. The confusion of a social disposition with statist leanings (which long characteried the Soviet reading of social regulation) pushed part of the Left to seek out a new balance. The “Second Left” thus replaced the traditional Socialist and Communist model by combining an alignment with neoliberal criteria with the prioritization of ”societal” questions. The disconnection of the social from the political sphere thus constituted the foundation of the gradual separation between the political left and the popular layers, which each fell out of love with the other. The continual weakening of the PCF — which had long remained the workers’ party par excellence — accelerated this phenomenon in the 1980s and ‘90s, condemning working-class areas to abstention, and, for the most destabilized part, a drift toward the National. Even when a revival of the social movements and the critical left began around 1993, this did not lead to any overall restructuring. The “social” and the “societal” eveloped in parallel, only rarely converging. As for the critical left, the PCF’s persistent retreat condemned it to a certain political marginality, which neither the brief far left breakthrough between 1998 and 2002 nor the strength of the left-wing “No” to the European Constitutional Treaty in 2005 were able to escape from. The 2017 elections thus mark a decisive rupture. The PS founded at Épinay in 1971 has manifestly reached the end of the long cycle of these last four decades which saw it steal a march on the PCF, win power, hesitate as to its orientation, and then get bogged down in Hollandism. In the coming months, the supporters of the PS will say how they envisage the future of French Socialism. For their part, the Communists will draw a balance-sheet of a rather tumultuous period. In the meantime, the simultaneous weakness of the PS and PCF also tells us that the Left has simultaneously reached the end of both its “democratic” and its “social-working class” cycle. In the form it took on in the twentieth century, around the PS-PCF coupling, the French left is now exhausted. It remains to be seen whether this exhaustion is only the exhaustion of a certain form, or if it corresponds to yet more fundamental realities. Roger Martelli is a historian of French communism and co-director of the website Regards .